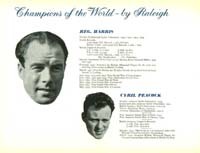 In production for longer than any of the other Raleigh "club " bikes (1949-1963) and indelibly associated with the immortal Reg Harris, Britain's greatest cycle champion of the era and Raleigh spokesman, the Lenton Sports was indeed "the undoubted thoroughbred of its class." More than that, it represented the last great era of traditional British club cycling. Its versatile specification harkens back to a time before relentless specialization, harsh Continental frame geometry and clacking derailleur gears. The Lenton was at home on country lanes as it was on time trials, as popular abroad, especially in the United States, as it was at home. A teenage John Lennon cycled the streets of his native Liverpool on his Lenton and for many, it was a first introduction to lightweight sports cycling. The R.R.A. 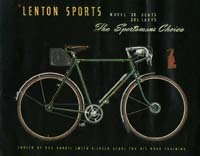 may have been more coveted and the Clubman and later Super Lenton better outfitted, but the Lenton Sports was the most popular lightweight British bicycle of a Golden Era. Spurred by the success of the Clubman introduced in the late 1948, Raleigh sought to market a companion machine, which, while retaining many of its popular features, would be more popularly priced. "Club" riding was experiencing an enormous post-war revival and with this new model, Raleigh aimed at the middle price bracket with a mount of equal appeal to the younger connoisseur sports rider as well as the weekend leisure cyclist. The new machine was given the model no. 28, previously assigned to one of Raleigh's rarest post-war machines, the Super Sports, which was in production only in 1947-48. This was a de luxe version of the Sports, no. 21. The Super Sports was a steel-framed club machine with added refinements such as celluloid mudguards and a detachable chainwheel (a rare version of the pre-war classic Heron's head model) painted in a vibrant orange enamel. 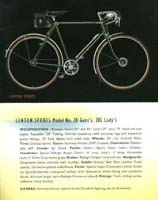 In its essence the new model 28 was a Reynolds 531 tube version of the Super Sports with 71° seat and head angles and offered in a 21" or 23" frame, gents model only. If the model number was recycled, so too was the name. 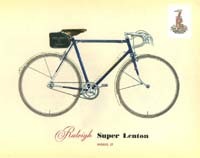 The newest Raleigh was called the Lenton Sports. Even today, "Lenton" is associated with British club and sport cycles, taking its name from the area in Nottingham where once stood the largest cycle factory in the world in Lenton Boulevard. This was actually the third Raleigh club bike so-named. The first, model no. 44 and 44L, was introduced in the 1940. Steel framed in 21" with a 71° angle with straight round tapered seat and chain stays, Russ type fork and Endrick 26" x 1 1/4" rims and three-pin detachable Heron's Crest chainwheel, it came in a metallic blue with chromed fork. Very few of these must have been manufactured before Raleigh ceased commercial cycle production for the duration of the Second World War. Resurrected in Raleigh's post-war range, announced in March 1946, and now assigned no. 25, the Lenton Sports' frame (still 21" and with a 71° angle) was now constructed of Reynolds 531 tubing with a newly designed fork and new colour: Polychromatic Olive. Although Cycling magazine praised it as being "a sound machine at a moderate price," it was withdrawn in spring 1947 and superceded by the Clubman in 1948. 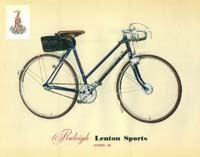 The latest Lenton was offered in Raleigh, Rudge and Humber models: the Raleigh Lenton Sports (no. 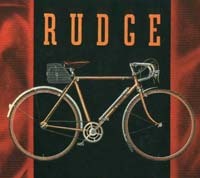 28), Rudge Pathfinder (no. 128) and Humber Clipper (no. 328), which varied only in their forks, colours and decals. The Lenton Sports introduced its own distinctive colour, Polychromatic Lenton Green, while the Rudge Pathfinder was finished Polychromatic Metallic Blue and the Humber Clipper in Polychromatic Lilac. The Lenton Sports represented real value for money. Its specifications, while lacking the Clubman's alloy components and pencil type backstays, gave the rider a quality, Reynolds framed machine of the highest quality at a most affordable price; £14. 16 s. 0. d vs. £21. 12. 11 d. for the Clubman. This combination of price and quality was a hallmark of the Lenton Sports for most of its long production run. Even when bested in specification by the Clubman and later the Super Lenton, it simply offered the most for the money. Introduced at the November 1948 British Cycle and Motorcycle Show, the Lenton Sports was widely praised as marking a new commitment by Raleigh towards the lighter, sporting machines in its post-war range. With the new model joining the Clubman and the Record Ace, Raleigh now offered the leading sports models in three distinct price ranges. The next in the Lenton series got a Royal introduction of sorts. In June 1949 T.H.R. Princess Elizabeth and the Duke of Edinburgh visited the Nottingham Quincentenary Trade Exhibition where they "spent a considerable time" inspecting the Raleigh stand featuring a new model: the Raleigh Lenton Tourist, no. 29. Also branded as the Rudge Aero Tourist (no. 129) and Humber Beeston Tourist (no. 329), this was described as being a "machine that is as suitable for business purposes as it is for touring" and having the most up-to-date specifications including a Reynolds 531 frame (21" and 23" gents only), 71° head and seat angles, Dunlop light alloy 26" x 1 1/4" rims, light alloy GB caliper brakes and hooded levers, alloy chainguard, 4-inch rubber pedals with alloy fittings and alloy 15/18th" Comfort Flat handlebar on an alloy stem. A Brooks B-66 saddle, kitbag and celluloid mudguards completed the specification while the Sturmey-Archer FM or AM medium ratio gear with alloy was optional. All three models were finished in Polychromatic Olive. Costing £20 3s. 11d. (AM gear), this was the outstanding new model of the 1950 season. The specifications for the Lenton Sports were improved over time. In 1950, Sturmey-Archer FM (four-speed medium ratio) light alloy shell hub gears were supplied stock instead of single-gears, the price rising to £17. 9 s. 11 d. A ladies 21" frame version was offered starting in 1951 as described in the Rudge catalogue: Far be it from us to dictate to the Ladies! In this instance, however, your wishes have been our commands and we offer you the first Lady's Pathfinder, the counterpart and fit companion of the renowned Gent's model. We have complete confidence of your approval and future enjoyment of this machine. That year the Pathfinders were offered in Polychromatic Gold with red lining. But this proved unpopular and in December 1951 was replaced by Polychromatic Maroon, the traditional Rudge livery. That season the lugwork was improved on the Lenton Sports, Pathfinders and Clippers. For the 1952 model year, the Raleigh Clubman, Rudge Aero Clubman and Humber Beeston Clubman were replaced by the new Raleigh Super Lenton,no. 27, Rudge Aero Special no. 127 and Humber Streak no. 327. These top-of-the-line racing machines were star attractions at the December 1951 London Bicycle and Motor Cycle Show. A reworked version of the Clubman, the new model came in both a 22" and a 23" frame (gents only) with 73° head and 71° seat angles with Reynolds 531 frame and fork, alloy caliper brakes with alloy hood levers, alloy Maes bend handlebars on a steel stem and steel Dunlop HP 27" rims with Raleigh quick release hubs. A Brooks B-15 "Flyer" saddle and celluloid mudguards were fitted. Finished in either Flamboyant Electric Blue or Lustre Orange, the Super Lenton initially lacked the chromed rear triangle and fork ends of the Clubman and was supplied as single gear machine with optional Sturmey Archer gears. Missing from the 1952 line-up was the Lenton Tourist. Its sophisticated specification and high price put it in an awkward corner in the market given its limited appeal to sports riders and it proved too expensive for tourist cyclists. 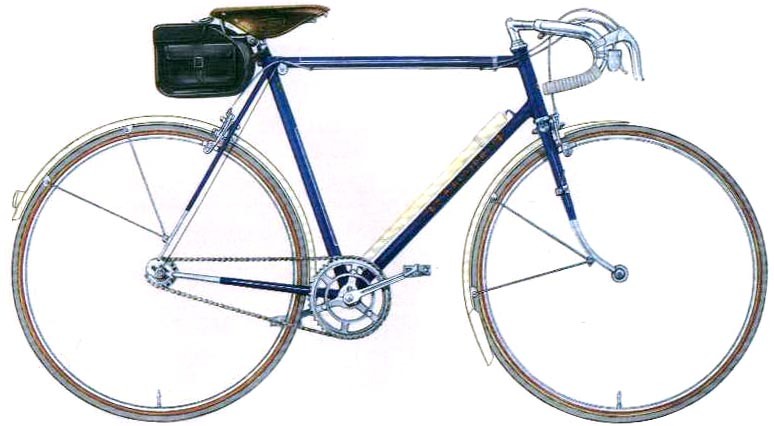 In its place was a 2030 steel frame version, the Trent Tourist, a popularly priced model that became one Raleigh's biggest sellers. By 1954, the colour range for the Lenton Sports had been expanded. While the Lenton Sports was still offered in its trademark Lenton Green, the Humber Clipper in Polychromatic Electric Blue and the Rudge Pathfinder in Polychromatic Maroon, any of three models could be also supplied in Polychromatic Mediterranean Blue and Lustre Royal Carmine. Mudguards and pumps for the blue machines were red. Big changes for the Lenton Sports came in 1955. The frame was reworked with thin taper backstays and tighter geometry (head 73° and seat 71°). The lamp bracket was switched from the stem to the right-hand fork and hooded brake levers fitted. The improved model was sold as the Reg Harris Road Model in honour of the great British sprint champion who uses a Lenton Sports for his road training and each featured a torch motif transfer with Reg's signature on the seat tube. The price, including FW gear, was 19.0 s. 10 d.
In 1954 Raleigh acquired Triumph Cycles of Coventry. In keeping with its policy of branding or marketing essentially the same cycle under different marques, the Triumph name was offered on most of the existing Raleigh range. Among the models introduced in November 1956 was the Triumph Torrington (no. 428), a rebranded Lenton Sports. This differed from the Raleigh model by having a fixed chainwheel featuring the Triumph name, a stem-mounted lamp bracket, Lycett or Wright's saddle instead of Brooks and was offered at 16. 19 s. 3 d. with single gear instead of a FM hub. By the late 1950s, sports cycling was changing and increasingly influenced by Continental practices including tighter frame angles, a move to specialization rather than the jack of all trades club machines and employment of multi-speed derailleurs. The British cycle industry as a whole experienced a serious downturn as the export market diminished, private motorcar ownership burgeoned and there were simply too many makers and brands chasing too few customers. There was life left in the Lenton Sports, however, as the market for sports machines was more buoyant than roadsters. To suit changing times, the warhorse of Raleigh's lightweight range was given a major makeover for 1957. That year the Super Lenton was discontinued and the Record Ace re-introduced as the R.R.A. Moderne. Dubbed the Marque III, the new Lenton now featured 27" x 1_" wheels with wide flange Continental style front hub and to accommodate provision (as an option to the usual Sturmey-Archer FM hub) of a Benelux four-speed derailleur, brazed-on fitments for bare wire controls on the top tube and chainstay were provided and the pump pegs relocated to under the top tube to make room for bottom tube lever. The large club style bag was deleted and provision of white tape and plugs on the handlebars and a white peak head imparted the au courant Continental flavor. The cost for the rejuvenated model went to 23.17 s. 6 d.; not quite the value for money of yore given the late Super Lenton, a far superior machine, cost 22. 12 s. 8 d. the year previously And ladies were not invited, at any price the Marque III, no. 3, was available only in a 21" and 23" gents frame. More changes ensued in 1958. The Lenton Marque III, now model no. 6, was to have been offered in Sunset Yellow with black head, mudguards and pump, was instead offered in Lenton Green with yellow head, mudguards, pump and handlebar tape or Royal Carmine with grey head, mudguards and pump with white handlebar tape. A new pattern of handlebar, the Reg Harris Road bend, was featured as was a new style of headlamp bracket which was fasted to a boss on the right hand fork blade. A final variant of the Lenton was also introduced in 1958. The Lenton Grand Prix, no. 7, was the first Raleigh with derailleur gear as standard fit: an eight-speed Cyclo-Benelux Mark 7 with a 14T, 16T, 18T and 20T block and a Williams double 46T/49T chainring with a Benelux hand-control front changer. Alloy brakes, a Brooks B15 "Swallow" saddle and Racelite hubs made for a high standard specification warranting a 27. 19 s. 6 d. price. This was offered in an entirely new colour: Silver Grey with white peak head and fitments or Sunset Yellow with black peak head and fitments. The 1961 models had a cable operated front derailleur instead of the rod-control. The Lenton range was last offered to the British market in the 1961 model year. Raleigh completely revamped its sporting and racing range with new models such as the Gran Sport, the first Raleigh to feature Campagnolo 10-speed derailleur gears, and the Blue Streak with a 10-speed Benelux derailleur. 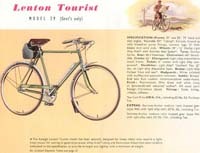 The last of the Lentons appeared in the 1962 North American catalogue as the Lenton Convertible featuring a three-speed AW hub and a three speed Cyclo-Benelux derailleur combination. By 1963 the Lenton was completely out of production. That year Sturmey-Archer ceased production of their classic club and racing FC, AC, FM, AM and ASC hubs. It was truly the end of an era, not only of a remarkably successful model, but of a quintessential British form of cycling. The Lenton was gone and with it the classic British club bike. 21" and 23" gents. 21" and 23" gents. 21" and 23" gents. 21" and 23" gents and ladies. 22" and 23" gents. 21" and 23" gents and ladies. 21" and 23" gents. 21" and 23" gents. 21" and 23" gents. Mudguard and Pump Fittings Mudguard and Pump Fittings Mudguard and Pump Fittings Mudguard and Pump Fittings and Pulley Boss (gents only). Mudguard and Pump Fittings and Pulley Boss, cable stops and bare wire on toptube. Mudguard and Pump Fittings and Pulley Boss (gents only). Mudguard and Pump Fittings (under top tube) and Pulley Boss, top tube and chainstay fitting for "bare wire" Derailleur control. Mudguard and Pump Fittings (under top tube) and Pulley Boss, top tube and chainstay fitting for "bare wire" Derailleur control. Mudguard and Pump Fittings (under top tube) and top tube and chainstay fitting for "bare wire" Derailleur control and on down tube for gear control. Special Super-chromatic Lenton Green. White lining. Special Super-chromatic Lenton Green. Polychromatic Olive Green. White lining. Special Super-chromatic Lenton Green. White lining. Flamboyant Electric Blue or Lustre Orange. White lining. Special Super-chromatic Lenton Green, Flamboyant Carmine or Electric Blue. White lining. Special Super-chromatic Lenton Green with Carmine head, Flamboyant Carmine or Electric Blue with White head. Lenton Green with yellow head, mudguards, inflator and handlebar tape. Or Flamboyant Royal Carmine with grey head, mudguards and inflator. White handebar tape. Silver lining Polychromatic Silver Grey with white head, mudguards, inflator and handlebar tape. Or Sunset Yellow with above items in black. "Suitable" lining. 2030 steel Raleigh pattern. "D" blades blades, solid ends. 2030 steel Raleigh pattern. "D" blades blades, solid ends. 2030 steel Raleigh pattern. "D" blades blades, solid ends. 2030 steel Raleigh pattern. Taper round blades, solid ends. Reynolds 531 specially designed, "D" blades, solid ends. 2030 steel Raleigh pattern. "D" blades blades, solid ends. 2030 steel Raleigh pattern. "D" blades to round blades, solid ends. 2030 steel Raleigh pattern. "D" blades to round blades, solid ends. 2030 steel Raleigh pattern. "D" blades to round blades, solid ends. Special design, 16" centres, 5" drop. Special design, 16" centres, 5 7/8th " drop. Alloy "Comfort Flat" 15/16th dia. Special design, 16" centres, 6" drop (gents) or 5" drop (ladies). Alloy Sylvere Maes 15/16th " dia. Special design, 16" centres, 6" drop (gents) or 5" drop (ladies). Latest Continental Pattern or, alternately, "All Rounder" style. Reg Harris Road bend, tape and white plugs. Reg Harris Road bend, tape and white plugs. Adjustable stem, 2" forward extension, head-clip fixing, Adjustable stem, 2 ½" forward extension, head-clip fixing. Alloy adjustable. Adjustable stem, 2 ½" forward extension, head-clip fixing. Adjustable stem, 2 ½" forward extension, expander bolt fixing. Adjustable stem, 2 ½" forward extension, head-clip fixing. Adjustable stem, 2 ½" forward extension, head-clip fixing. Adjustable stem, 2 ½" forward extension, head-clip fixing. Adjustable stem, 2 ½" forward extension, head-clip fixing. special rubber grips. R.I. Rubber 6" Silver Grey Sleeve Grips. 5" R.I. Rubber grey grips. R.I. Rubber 6" Silver Grey Sleeve Grips. R.I. Rubber Silver Grey Sleeve Grips. R.I. Rubber 6" Silver Grey Sleeve Grips or, tan rubber grips for "All Rounder" bars. White tape and plugs or, tan rubber grips for "All Rounder" bars. Yellow or white tape with white plugs. White or black tape with white plugs. front and rear caliper. front and rear caliper. Alloy caliper front and rear. front and rear caliper. Alloy caliper front and rear. Hooded levers. calipers with hooded levers. calipers with hooded levers. calipers with hooded levers. Alloy calipers with hooded levers. 3-pin detachable. 46T flanged racing 3-pin detachable. 46T flanged racing 3-pin detachable. 46T flanged racing 3-pin detachable. 46T flanged racing 3-pin detachable. 46T flanged racing 3-pin detachable. 46T flanged racing 3-pin detachable. 46T flanged racing 3-pin detachable. 46T flanged racing Williams double chainwheel, 46T/49T with Benelux front chain shifter (hand control). Renold Elite Renold Elite Not specified. Renold Elite Renold Elite Renold Elite Renold Elite with SA gear, Perry with Benelux. Perry "53" Renold. 6 ½" fluted. 6 ½" fluted. 6 ½" 6 ½" fluted. 6 ½" fluted. 6 ½" fluted. 6 ½" fluted. 6 ½" fluted. 6 ½"
racing type. Sports steel. 4" rubber with alloy components. racing type (gents)rubber 3½" (ladies) Sports steel. racing type (gents)rubber 3½" (ladies) Raleigh steel quill. Raleigh steel quill. Raleigh steel quill. Gears (as fitted) UK market. 66.4" free. 74.7" fixed. Sturmey-Archer FM alloy shell medium-ratio hub gear. 66.4" free. Sturmey-Archer FM alloy shell medium-ratio hub gear. 66.0" and 77.6" fixed. Sturmey-Archer FM alloy shell medium-ratio hub gear. Sturmey-Archer FM alloy shell medium-ratio hub gear OR Benelux 4-speed derailleur. Sturmey-Archer FM alloy shell medium-ratio hub gear OR Benelux 4-speed derailleur OR Fixed and Free, large flange rear hub. Cyclo-Benelux 4-speed, Mark 7, with 14T, 16T, 18T and 20T block. 8 speeds with double chainwheel. 26" x 1¼" Endrick rims. Stainless steel spokes 26" x 1¼" Endrick rims. Stainless steel spokes 26" x 1¼" Dunlop Light Alloy Westrick pattern, stainless steel spokes. 26" x 1¼" Endrick rims. Stainless steel spokes 27" x 1¼" Dunlop HP steel rims. Stainless steel spokes 26" x 1¼" Endrick rims. Stainless steel spokes 27" x 1¼" Endrick rims. Wide flange front hub. Stainless steel spokes 27" x 1¼" Endrick rims. Wide flange front hub. Stainless steel spokes 27" x 1¼" high pressure, Racelite large flange hubs, double butted spokes and domed axle nuts. Dunlop Sprite Dunlop Sprite Dunlop Sprite Dunlop Sprite Dunlop Roadracing. Dunlop Speed Dunlop White Sprite Dunlop White Sprite, Presta valve. Dunlop H.P. Road Racing, Presta valves. Brooks B15 Brooks B15 Brooks B66 Brooks B15 Brooks B15 Brooks B15 Brooks B15 Brooks B15 Swallow. Brooks B15 Swallow. Detachable White Celluloid with spearpoint extension and mudflap. Detachable White Celluloid with spearpoint extension and mudflap. Detachable White Celluloid with spearpoint extension and mudflap. Detachable White Celluloid with spearpoint extension and mudflap. Detachable White Celluloid with spearpoint extension and mudflap. Detachable White Celluloid with spearpoint extension and mudflap. Detachable Narrow Section White Celluloid with spearpoint extension and mudflap. Alloy stays. Detachable Domed Section Grey or Yellow Celluloid and mudflap. Detachable Domed Section White or Black Celluloid and mudflap. on stem. on stem. on stem. on right fork blade. on right fork blade. on right fork blade. on right fork blade. Adjustable, fitted to boss on right fork blade. Adjustable, fitted to boss on right fork blade. kitbag, inflator, reflector kitbag, inflator, reflector kitbag, inflator, reflector, alloy chainguard. kitbag, inflator, reflector kitbag, inflator, reflector kitbag, inflator, reflector Inflator and reflector Kitbag, tools, 17" inflator, reflector. Kitbag, tools, 17" inflator, reflector. £14. 12 s. 11d. incl. tax. £17. 19s. 2d. incl tax. £20. 3 s. 11d. incl. Tax., £22. 10 s. 9 d. with SA AM hub. £18. 2 s. 3 d. incl. tax. £19. 6 s. 6 d. incl. tax. £23.17 s. 6 d. incl. tax £25.18 s. 3 d. with SA 4-speed gear, £25.13 s. 6 d. with Cyclo Benelux gear, £22.19 s. 6 d. fixed and free. £27.19 s. 6 d. incl. tax. Transfers/Decals - there are changes between the 1950 and 1951 catalogue illustrations. 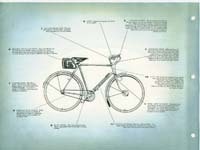 The 1950 illustration shows a smaller downtube RALEIGH transfer with a smaller, single arrowhead than in 1951. The 1950 picture shows no white lining, nor is it mentioned in the specification. In 1951 white lining is apparent in both picture and text . The 1952 catalogue has a line Due to scarcity of materials specifications are subject to alteration without notice. 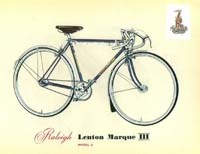 The Raleigh catalogue for 1957 lists the Lenton Sports in 1956 spec., the model changed to Marque III in Spring 1957.